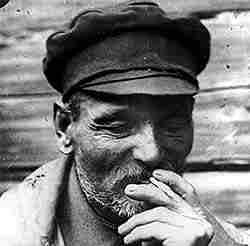 During the early days of Stalin, Vasili Komaroff was a horse-trader known as "The Wolf of Moscow". Vasili mainly killed for money. His first victim was uncovered in 1921. Twenty-one victims in all were found either strangled, bound, doubled-over and dumped in vacant lots around the Shabolovki District. Authorities linked the killings to the horse-trading market in Moscow that happened every Wednesday and Friday. Authorities soon discovered, anyone whom left with Vasili to see his horses were never to be seen or heard from again. Police found his latest victim stuffed in a sack in the stable upon questioning him. Panicked, "The Wolf of Moscow" jumped out the window and escaped. Several days later he was picked up and confessed to thirty-three murders, eleven not under investigation. Within the next few days he uncovered five new corpses for the authorities. The other six victims he dumped in the river and their bodies were never recovered. Vasili named his wife Sofia as an accomplice in which they were both found guilty of multiple homicides and sentenced to death. On June 18, 1923, they were disposed of via firing squad. Vasili Komaroff serial killer is a male serial killer. The Wolf of Moscow, The Shabolovka Street Killer is a male serial killer.